Otago Girls’ High School opened on 6 February 1871. The first public girls’ secondary school in the southern hemisphere, it was the outcome of seven years of campaigning. After the local public boys’ high school opened in 1863, an editorial in the Otago Daily Times (ODT) called for a ‘companion institute’ for girls. Learmonth White Dalrymple from Kaihiku, South Otago took up the call and led a campaign to establish a girls’ high school. Over the next seven years, she lobbied politicians, set up a petition, and wrote hundreds of letters to British educationalists. 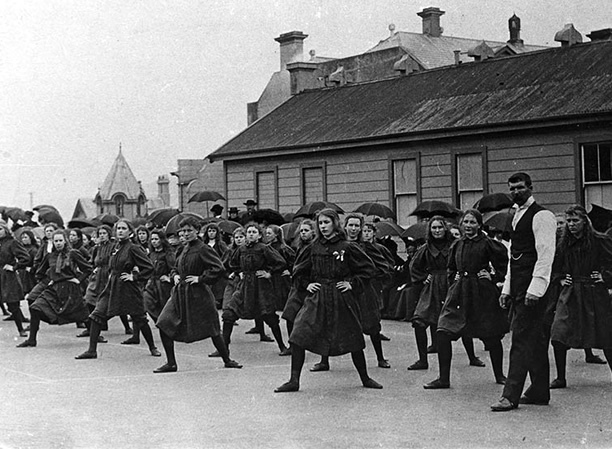 On 6 February 1871, the Otago Girls’ High School opened with 78 pupils. By the end of the year, the number had increased by two-thirds to 130. Editorial, Otago Daily Times, 28 January 1869, p. 4. Editorial, Otago Daily Times, 10 October 1870, p. 2.
 Letters to the Editor, Otago Daily Times, 11 October 1870, p. 3; ‘The High School’, Otago Daily Times, 31 October 1870, p. 4. We have 21 biographies, 5 articles, related to First public girls' secondary school.